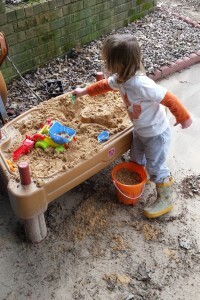 I realized this morning I’m late on my weekly blog post. I knew yesterday was Monday, and I kept feeling like I was missing something all day, but just couldn’t put my finger on it. Well, now I know what it was. I’m sure you’re all wondering how the new experience of Mother’s Day Out went for Jellybean. Well, it went great last week. He was so excited to play with new kids. The first day, we were outside with a bunch of other families waiting for the door to open. He was holding my hand and he had this smile on his face watching the other kids play. He kept leaning forward, as if he was going to run off and play, too, but then he’d sway back and lean against me. When the door opened, he was ready to go. I got him to his room, talked to his teacher for a little while and went to kiss him goodbye. I said, “I’m going to leave, but I’ll be back this afternoon to pick you up, like we talked about, ok? I love you.” His response? “Ok, bye.” He did really well, had a great day and even napped! So last week was fun, but today.. oh today. When I walked out of the room, he ran toward me and wanted another hug, so I hugged him and picked him up. He said, “Swing, slide!” (He wanted to go to the playground) and I had to tell him that no, he needed to stay in the room and I would be back later to pick him up. Then he cried. It was a big, ugly cry, too. All I could do is turn around and walk out of his sight. His teacher took his hand and lead him to the art project for the day and when I peeked around the corner again, he was ok. But oh, the heartbreak! There was another mom standing nearby who’s kid is in Jellybean’s class. She said her son just could not stop talking about mine last week. He says that Jellybean is his best friend. It’s so sweet and made me feel good that he has a little friend to look out for him. So, what did I do with my extra time last week? Well, first, I took a shower. I didn’t have to worry about a toddler having free reign on the house (although he usually hangs out in the bathroom with me when he’s here.) I didn’t have to hurry because someone else needed the shower. I didn’t feel guilty for using as much hot water as I wanted. It was glorious. Thursday I mowed the yard and got to take ANOTHER shower! My main intention was to use the time to work on commissions, but I haven’t done that yet. I did manage to get the knitting done on my current commission project last night so all that needs is a bath and a block. I did do something fun today. I took an old worn-out quilt and cut pieces out for smaller quilts. I cut one piece to be a small quilt for Jellybean. I repaired some of the holes where the pieces were coming apart and sewed some binding on the front. I just have to sew the binding down on the back and he’ll have a new little blanket. I cut another piece to make a blanket for the dog’s bed. I just zig-zagged around the edge of that one and it’s done. It’s been nice to sit at the sewing machine today. That’s all I have for this week. Thanks for reading and have a great week! Boy, this last week has been a big one. I’ve spent most of the week with stuff related to Jellybean. On Monday, his new big-boy bed was delivered. No more sleeping in the crib, this kid has a huge double bed, now. 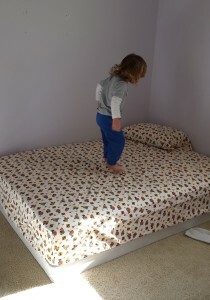 It’s made a difference – he’s been sleeping so much better than he was on the old, cheap mattress we had in the crib. ($30 mattress that lasted a year and a half before it got too uncomfortable.. that’s not too bad!) He’s got one set of dinosaur sheets and one set of construction vehicle sheets and he’s pretty happy! Testing out the new bed. 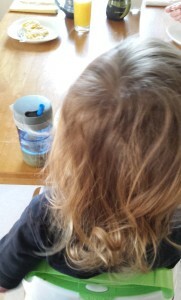 Look at that hair!! Tuesday was a REALLY big day. First on the list was his very first haircut. He had been complaining about his hair being in his eyes and getting in his mouth when he was eating, so I made an appointment to get it cut. He did so great, didn’t cry or refuse the cut. I had to hold him a little bit, but mostly I just held his hand while I cried. There went the last little bit of baby. He’s a little boy, now. After. It really does suit him. 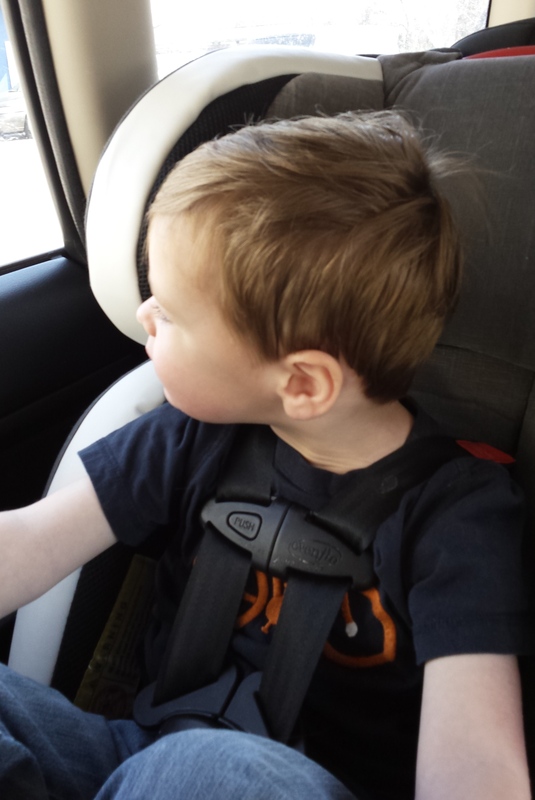 After the haircut, we toured two places for Mother’s Day Out. We’re lucky that one of them has a spot available, and he starts tomorrow. This is a big step for us, and one that I think I probably should have taken sooner. He’s so active and so interested in what I’m doing that it makes it difficult to get any real work done around the house. So, for a few hours a day, twice a week, he’ll be hanging out with kids his age and Mama gets some time. I’ve got so many plans for that time, I know it won’t all get done, but I hope I can be productive with it. The rest of the week, I have spent preparing myself for the Mother’s Day Out. Making sure I have a blanket, enough diapers, and change of clothes packed up. 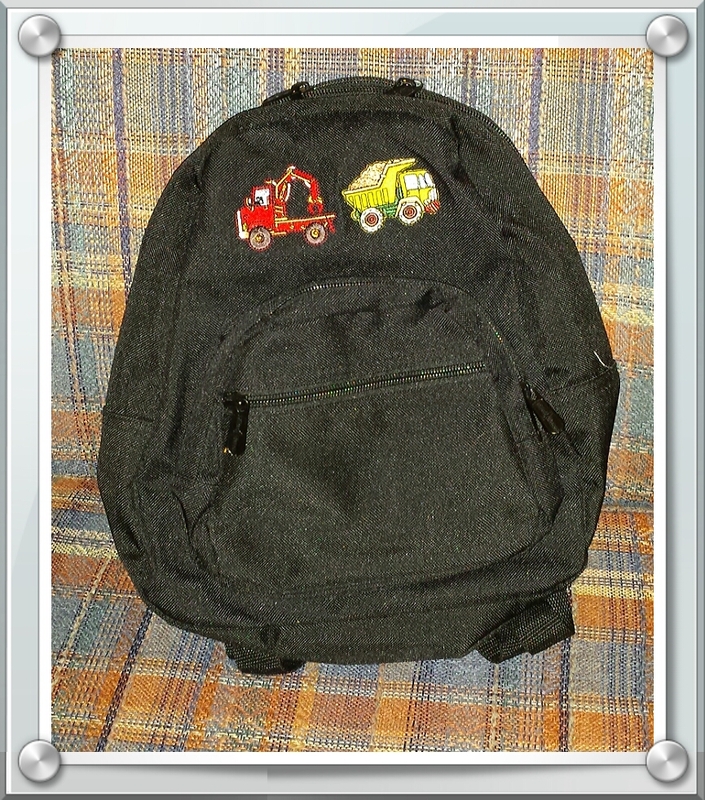 Getting a small backpack for him to carry his stuff. And trying to figure out what in the world I can send for his lunch (nothing messy; nothing that needs to be heated up; just simple, easy-to-eat foods that he can manage pretty much on his own.) I think It’ll probably end up being a granola bar, banana, cheese stick with maybe some carrot/pepper/celery sticks and nuts. I hope that out of all of that, he’ll eat SOMETHING. Since the decision to try to find a place was so quick, and at an odd time of the year, stores don’t have their school supplies out right now and I didn’t have time to sew anything. Thank goodness the program has extra nap mats – those are NOWHERE to be found right now. I went thrift store shopping for the backpack and I found one – it was the right size, solid black, no cutesy characters or anything…. 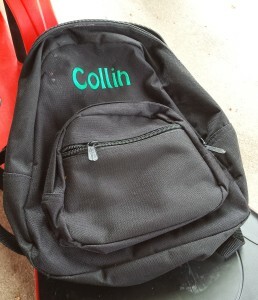 but it had “Collin” embroidered on it. I looked at it for a long time. Except for having someone else’s name on it, it was perfect. I bought it anyway. I took my handy seam ripper to that embroidery, and pulled it all out. 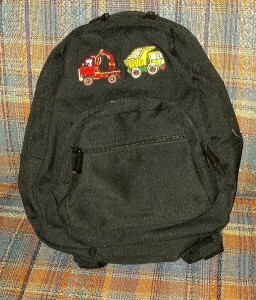 Then I found some iron-on applique patches of a dump truck and a loader. Simple and quick and it’s almost brand new! All that’s left to do now is to fill it full of his stuff. I’ve been knitting in the little spare time I’ve had. I’m working on some commissioned projects that I can’t show you until after Christmas. Tomorrow’s supposed to be rainy and yucky here so I’m hoping to get a good amount of work done on them. 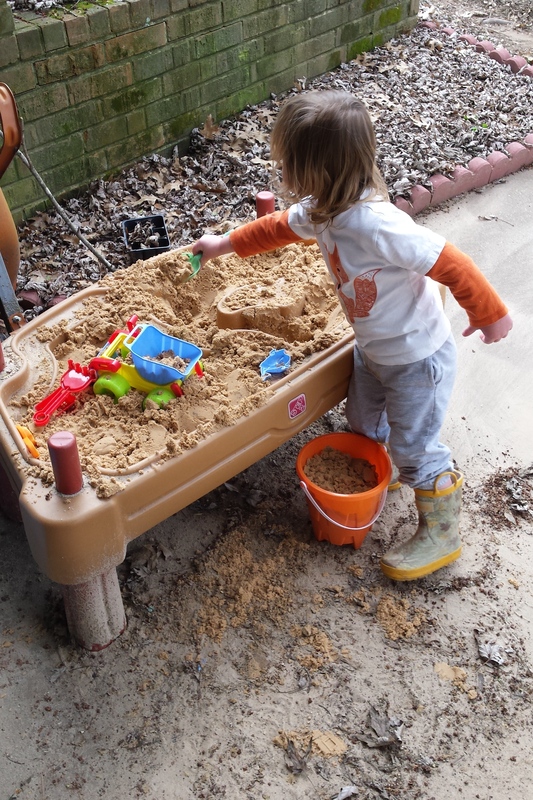 Enjoy your week as if you were a toddler with a sandbox!